Dropcast is pretty easy to navigate. The multiplayer options are within "Battle Royale" (the only option that makes sense). Opening credits aren't ridiculously long. Download time is average (or maybe a little longer), as is broken into several consecutive smaller bits. While the buffer space is visually sufficient, the tappable areas are extrememly small and misses result in nothing happening and the need to re-tap. Playing Dropcast is as simple as tapping. Tap in the right places at the right times. Overall, the mechanic works well and is very responsive. The squares are, however, extremely small, making it difficult for anyone who doesn't have great aim. Two of the basic attacks also share the same symbol on their squares (triangles), making it difficult for people that are color blind. For most of the game-playing world, however, these problems aren't a factor. There really aren't any problem with the in-game graphics (they're just small square with colors and symbols). The music doesn't really matter one way or the other, but the sound effect do let you know when an attack is on the way. The sound can be skipped IF you pay close enough attention to the "news bulletins" that pop up at the top of the touch screen. There are four different characters to choose from and multiple people are able to select the same character. Unfortunately, there is no downloadable demo. When taken on its own, Dropcast is a simple-but-fun puzzle game, but it may seem familiar to puzzle game afficionados. I found Dropcast to be reminiscent of a cross between Collapse and Meteos. Compared to Meteos, it's not as good (very few games are), but it's a similar look and where Meteos uses dragging of the squares, Dropcast uses tapping of the squares. Dropcast is even more similar to Collapse. Compared to Collapse, Dropcast's multiplayer adds attacks, different patterns, and special abilities. What the game's multiplayer does with the basic Collapse engine is fun and innovative, but it doesn't really come close to Meteos. For this type of game, the level of fun you have will depend on who your opponent is. Include a downloadable demo of the single player experience. Enlarge the tappable areas in the menu system. Change the symbols so that each attack/action has its own (no duplication). Enlarge the squares slightly (width only?) by offering an option to cut back to eleven - or even ten - columns. 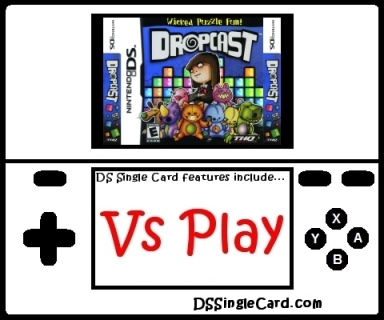 Click here to return to the DSSingleCard.com Dropcast profile.